The entire Nadich extended family is immensely proud and grateful tonight. 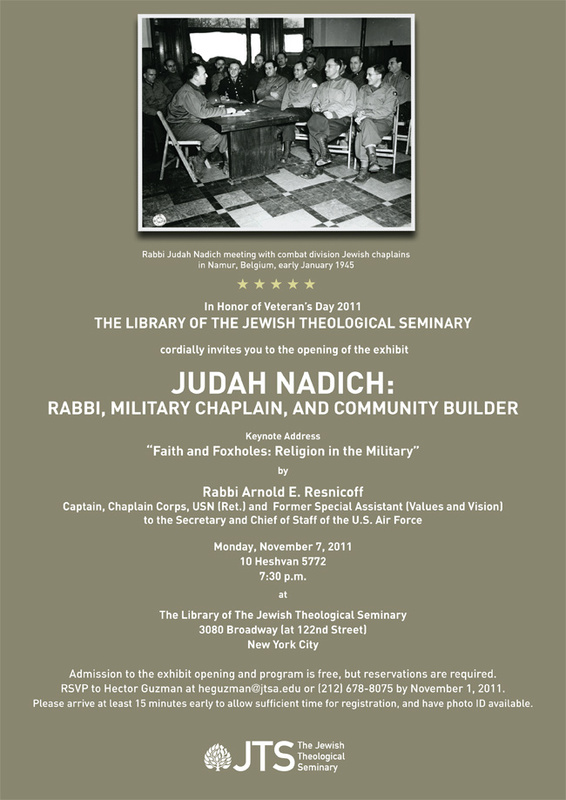 This exhibit is the culmination of a process that began some three and a half years ago, when our family decided to donate our father’s voluminous papers, records and documents from over fifty years in the active rabbinate to the archives of the Jewish Theological Seminary. His precise and thorough notes, journals and records reflected his personality, but also his keen sense of history. He was well aware that he was witness to cataclysmic events in Jewish history, both during WW II and afterward, events that he had responsibility to record for future generations. His record-keeping included not only journals, sermon-notes (from every single sermon spanning 60 years! ), clippings and professional correspondence, but also, during the war, almost daily letters to his sisters in Baltimore describing the daily challenges of chaplaincy during those tumultuous and often tragic days. He asked them to save the letters for his return; we found them in chronological order among his papers. Later on, he recorded, in daily letters to his then-fiancé, our mother, the daily challenges of a grueling speaking tour throughout South Africa to raise funds for WW II survivors. When our family considered what to do with this treasure-trove of historical material, we knew that the Seminary was just the natural place for them. Our father had studied here with the הדור גדולי(the great scholars of his generation) who influenced him throughout his career (and handwritten notes from their courses are included in the archives); our mother, Hadassah Ribalow Nadich, graduated from the TI and worked here as Executive Secretary of the Rabbinical Assembly. Our parents’ romance and 60-year partnership began in this building during a Rabbinical Assembly convention, when our father was just out of military uniform. Our father served on the Seminary board for many years. Both our parents were deeply and passionately devoted to the Seminary, its mission and its values. So you see, the Seminar is “home” for these archives. Thanks to an agreement between the Seminary and the US Holocaust Museum in Washington DC, the materials related to his service during World War II also reside at the US Holocaust Museum in Washington, but the entire archival collection is at the Seminary. We hope that, beyond those who come to view this wonderful exhibit, researchers and scholars will mine these archives for what they can tell us about the survival and flourishing of the Jewish people from its darkest days to the bright promise of a thriving global Jewish nation that we hope will be fulfilled במהרה בימינו. Our אבא ואמא, סבא וסבתא (Aba, Ima, Saba, Savta) would be truly proud tonight. The crown of our head has fallen. I never had the zechus to know either of Nommi’s parents, so I know them through her. Through the stories that Nommi has been kind enough to share with me, yes, but that’s only part of it. I also know them through the way that Nommi carries on their work, the way that she models who they are. Talking to Nommi after her mother was niftar, I said that the more I learn about her parents, the more I understand where she came from. The email below was written by Reena Ribalow, a poet and writer who lives in Jerusalem. She is the niece of Martha Hadassah and cousin to Leah, Shira, and Nommi. This is a tribute to Rabbi Judah Nadich z"l and Martha Hadassah Ribalow Nadich z"l, created and maintained by their family. If you have a memory or thought to share, please submit it to nadichblog at gmail dot com. Entries in the 'eulogies,' 'kavanot,' and 'writings' categories may be reprinted and distributed for noncommercial purposes if proper credit is given. Please let us know if you plan to use any text from these categories.